I was inspired by Laura’s post a few weeks ago on 20 Instagram profiles to follow this year, and it got me thinking about what profiles I would choose. And then I started thinking about what profiles I would choose across other platforms. There are so many different social media platforms out there, but I think that some people really shine on certain outlets. Here’s how I went about the daunting task of trying to narrow this down to just 10: I tried to think about who I would follow regardless of whether I had any interactions with them. I obviously follow a lot of people on Instagram or Vine because I follow (and love) their blogs and want to follow them as an extension of that. I tried to be more objective here and think about who is really rocking the platform independently of me being interested in the rest of their brand. You’ll notice that I’m entirely obsessed with stationery and illustrations. And the occasional pet. @annariflebond of Rifle Paper Co. || Besides loving Rifle, the images are all beautifully styled. @bunnymama || This is definitely the odd one in the bunch- I just get a lot of daily enjoyment out of those bunnies. @casslavalle of coco + kelley || She gets some nice variety and everything is beautiful. @heygorgevents of Hey Gorgeous Events || The name pretty much says it all- I just love the pretty and feminine quality in all of her pictures. @jennifer_blair_ of Jennifer Blair Photography || I had to include at least one photographer in the bunch! Her photos are all gorgeous and they make me feel like we’d be friends in real life. @_kristinb of A Handwritten Blog || Her photos are so airy and clean that sometimes it feels like she’s lives in a different (and much prettier) world than I do. @maemaepaperie of MaeMae Paperie || I’m a huge fan of her work and her pictures are always inspiring. @michaelanoelle of Michaela Noelle Designs || I love her girly style and how it comes through in all her images. @oanabefort of Oana Befort || I’ve always loved her work, I love seeing her paintings pop up in my feed! @scoutshonorco of Scout’s Honor Co. || I love her graphics and she does a good job capturing where she draws inspiration. You’re probably going to pick up on a theme here by the end: babies and puppies. I follow most of them on Instagram too, so I recommend that you check them out there as well. Sorry for the lack of links on the profile- like I said last week, that’s one of the things that is annoying about Vine! Bri Emery of Design Love Fest || I love how quirky she is and how she is able to get her personality across on a 6 second video. So fun! Becka Robinson of Life of an Artistpreneur || She has a cute baby and always puts an artistic spin on things. Win. Bonnie Tsang of Bonnie Tsang || I really like how she uses music in her videos, and she just has a great eye. Grace Bonney of Design*Sponge || Because who doesn’t want to watch the behind the scenes of DS? Joy Laforme of joy laforme || Joy’s illustrations are beautiful and I love watching them unfold in motion. Katelyn James of Katelyn James Photography || I’m a little obsessed with Bokeh. natthefatrat of Nat the Fat Rat || Also obsessed with Huck. oh joy of Oh Joy! || Because Ruby is just the cutest thing. Paperfashion of PAPERFASHION || I love watching her work come to life. 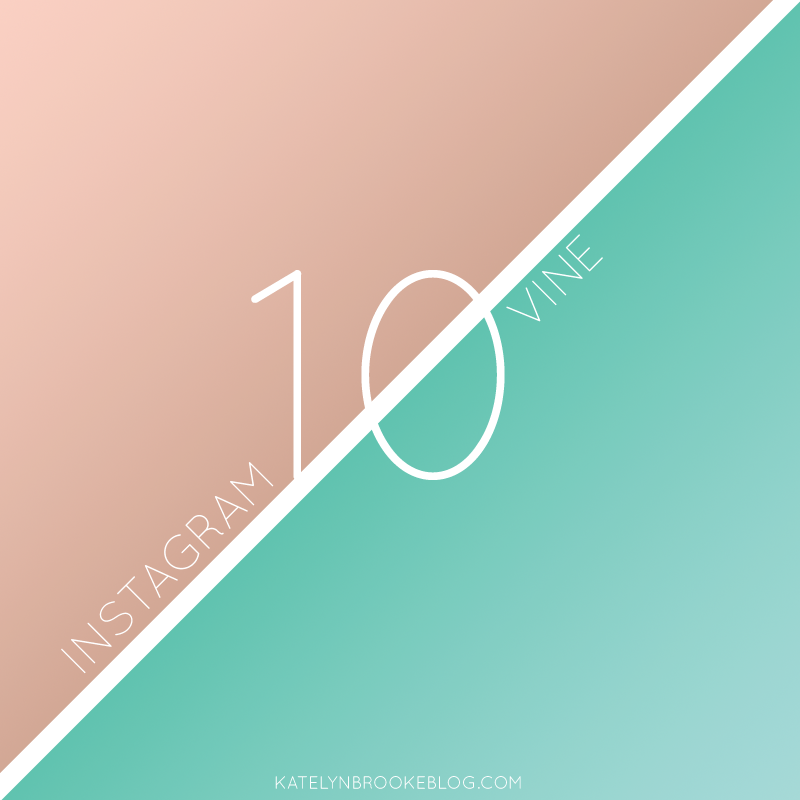 Are you on Instagram and Vine? Let’s connect! Who are your favorite profiles to follow? I’d love to hear! Next week I’ll be doing Pinterest and Dribbble, so stay tuned! So many great people. I just added a bunch on Instagram, now I just have to check out Vine. Bri’s Vines are always great and it’s so interesting watching art come together on Paperfashion. Those are definitely 2 of my favorites. Aren’t they cool? I feel like some people are so naturally good at Vine! No problem- I loved your post! I just got it at the end of October, so I’m not much ahead of you! Isn’t it addicting? Enjoy! I found you! That’s actually one of the things that I think is really weird about Vine is that it’s connected to Twitter but you search by name as opposed to username… oh well! Yeah, I think I probably found her through you! I don’t really know her at all but her pictures are so pretty!